Qian Timing is a 3rd Generation Master of the Changzhou branch of Wu Dang Free-Step Taijiquan. 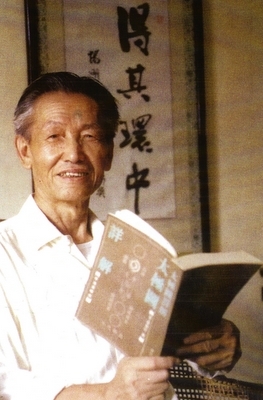 Grandmaster Qian was born in 1929. He started learning Taijiquan in 1952 to preserve his health. Later Grandmaster Qian became a disciple to his master, Yang Kui-Shan. He trained with his master, Yang Kui-Shan for twenty years. In those twenty years, he learned Wudang Free-Step Taijiquan, Baguazhang, Taiji Long Staff and Wudang Continuous- Stepping Sword. He has entered into several competitions in China, winning the gold medal in 1986 in national martial arts, and in 1989 in the first martial arts festival held at Wudang Mountain. He has been awarded the title of high level 8th Duan in the field of Chinese Martial Arts. Grandmaster Qian has been teaching his art for over twenty years and has been featured on the cover of “Tai Chi Magazine”. Grandmaster Qian has published over forty articles on Qigong and Taiji. Grandmaster Qian has been a researcher at the Wudang Style Boxing Research Institute in China, Chairman of the Chang Zhou City Martial Arts Association, Director of the Taiji Department at Jiang Su Martial Arts Association, and has been featured in a book on martial artists called, “Biographies of Distinguished People in Chinese Martial Arts”.